Hundreds of individuals facing the end of life are not alone as a result of a relationship with a Doula Volunteer. Our volunteers and those they visit form meaningful connections over weeks and over years that touch both of their lives. 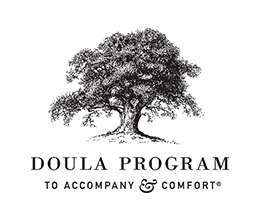 Since 2001, The Doula Program to Accompany and Comfort, a nonprofit organization, has been the only organization of its kind specializing in training, carefully matching and supervising Doula Volunteers. We have gained national and international respect for our work that has been recognized in the New York Times. Our diverse group of Doula Volunteers visit individuals living at home, in nursing homes and in hospitals. Our volunteers visit weekly with one individual until he or she dies. The Doula Program to Accompany and Comfort also created the hospital based Palliative Care Doula Volunteer program in response to the needs of individuals with critical illness. The organization provides consultation on customized Program implementation, training curriculum and programming for professionals on end of life issues. "Community is more verb than noun. Community is continually created through mutually valued interactions that spring from a fundamental sense of connection. The Doula Program to Accompany and Comfort exemplifies the declaration that forms the elemental core of civilization: We matter to one another! In the doulas' simple, essential service – showing up, leaning forward – and their hosts' receptions, we become human. As a teacher, I often pose the question: What would it look like to live in community with one another – rather than merely in proximity to one another – through illness and dying, caregiving and grieving? The Doula Program's trained volunteers are living the answer!"